A separate article called March 18 historic. Putin and Russian parliamentarians declared support for Crimea joining the Russian Federation. So do 92% of Russian citizens. Crimeans are going home. They’re legally entitled to do so. It’s their fundamental right. Not according to Washington. Mainstream media march in lockstep. Throughout Ukraine’s crisis, Times editors, commentators and correspondents systematically bashed Putin. They’ve done so relentlessly. They’ve done it irresponsibly. Washington and rogue EU partners bear full responsibility for Ukrainian/Crimean crisis conditions. Putin forthrightly went all-out for resolving things responsibly. Obama, David Cameron, Francois Hollande, Angela Merkel, and Kiev fascist putschists ignited a potential clash of civilizations. They recklessly risk WW III doing so. Crimeans are legally entitled to declare self-determination. Joining Russia is their legitimate right. Moscow legally embraced them. Don’t expect Times editors, commentators or correspondents to explain. Their assertion doesn’t rise to the level of bad fiction. It doesn’t wash. It doesn’t pass the smell test. It doesn’t stop WaPo editors from repeating one Big Lie after another. Russia committed “aggression,” they hyperventilated. Unless stopped, “the result will likely be more,” they claimed. “…Putin’s brazenness continues to escalate.” US officials lied. Not according to WaPo editors. What rubbish! You can’t make this stuff up. Monitors observing Sunday’s referendum pronounced it scrupulously open, free and fair. Not a single irregularity was reported. Sunday’s vote was a model democratic exercise. It shamed America’s sham process. Don’t expect WaPo editors explain. They’re preoccupied concocting new Big Lies. It’s standard mainstream media practice. Truth is systematically buried. Lies, damn lies and misinformation substitute. WaPo editors urge hardball tactics on Russia. They want “real pain” inflicted. Perhaps they want WW III. Charles Krauthammer is one of many neocon WaPo columnists. He’s a lunatic fringe hard-right contributor. He’s militantly pro-war. He deplores peace. “What is to be done now,” he asked? “Reassure NATO. Deter further Russian incursion into Ukraine. 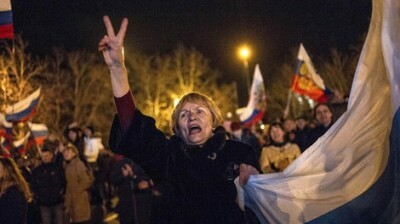 Reverse the annexation of Crimea,” he urged. Disregard rule of law principles, he suggested. Advance NATO to Russia’s borders, he signaled. Confront Russia belligerently if necessary, he implied. He wants decisive action. He wants Russia “severely squeez(ed)”. He wants it weakened and isolated. He wants “an emergency increase in defense spending.” Minimally $100 billion annually. He barely stopped short of urging war. Other US lunatic fringe members perhaps want it. “(W)atch out, Moldova,” Journal editors added. Perhaps they heard the news. Previous articles discussed Mitt Romney’s hard-right agenda. He was 2012 Republican presidential aspirant. He was indistinguishable from other party primary opponents. They looked more like a police lineup than legitimate candidates. Romney made millions of dollars the old-fashioned way. His vulture capital tactics stole it. It profiteered unscrupulously. It did so with leveraged buyouts and asset-stripping companies. It willfully bankrupted them. It left thousands of employees high and dry on their own. He lied claiming Iran heads toward developing nuclear weapons. Assad must go, says Obama, but efforts to remove him aren’t implemented, he said. Obama doesn’t act decisively, he claimed. He wants tough action following tough talk. He lied claiming Putin invaded Crimea. He repeated the Big Lie regurgitated daily. Mainstream media do so in lockstep. He barely stopped short of urging war on Russia. Lunatic fringe current and former politicians think this way. Former Congressman Ron Paul is geopolitically opposite Washington neocons. Crimeans are legally titled to join Russia, he said. He was unequivocal citing “clear evidence that US-sponsored NGO’s” got billions of dollars to “agitat(e)…Our hands are not clean,” he stressed. Meddling in Crimean internal affairs is unjustifiable, he added. It’s their choice whether to stay with Ukraine or join Russia. “I think everyone should have the right to express themselves” freely, he stressed. It’s none of Washington’s business what they do. Sovereign people should make their own “decisions,” said Paul. Other nations have no right to interfere. Washington claims a divine right to do it. Empire building defines its agenda. Doing so risks global war. Unchallenged dominance alone matters. Hegemons ignore potential consequences. Bipartisan Washington neocons think this way. Potential clash of civilizations disaster may follow. It airs three times weekly: live Sundays at 1PM Central time plus two prerecorded archived programs.